In recent years there have been a number of disturbing incidents of peer review fraud. The largest and most consequential was the case of Tumor Biology, which resulted in the retraction of 107 papers, as well as getting de-indexed from Web of Science. Some other recent breaches of peer review integrity include retractions in Flow Measurement and Instrumentation, Cancer Letters, and Measurement. Peer review, at the heart of research, is the last bastion to the integrity of science. Maintaining its integrity is critical; otherwise all of scholarly communication is at-risk. The vast majority of scientific and scholarly publishers work hard to preserve the integrity of the research in their journals and books. These publishers are dedicated to providing relevant, credible research to their readers. But given the rise of research and manuscript submissions, oversight of incoming submissions can become overwhelming. In an effort to assist publishers with identifying potentially fraudulent peer reviews, the latest release of ScholarOne Manuscripts includes a pilot program to detect unusual submission and peer review activity that may warrant further investigation by the journal. Journals will see a risk indicator on the reviewed manuscript using proprietary algorithms based on existing web traffic and server data such as when Reviewers are suggested by the Author and when Reviewers use a non-institutional email address. 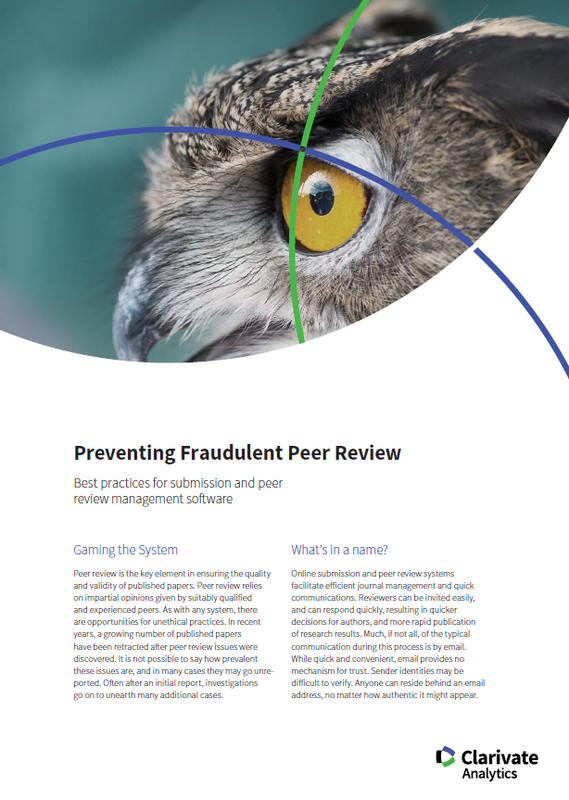 Download the white paper to discover methods for identifying potentially suspicious peer reviews along with software specific solutions. Are you ready to talk with the ScholarOne team about Unusual Activity Detection or about a comprehensive workflow management systems for your scholarly journals, books, and conferences?